A battling, hard fought victory on Tuesday night saw the Blues back to winning ways, albeit with Leighton Baines leaving the game injured and Lucas Digne getting a straight red for a professional foul. Everton returned to Premier League action on Tuesday night, following the FA Cup exit at Millwall, by crossing the Pennines to the John Smith’s Stadium take on bottom-of-the-table Huddersfield Town. Both clubs needed three points, Huddersfield to retain any hope of Premier League survival, Everton to salvage some semblance of self-respect for the rest of another poor season. The Terriers recently parted company with German coach David Wagner who guided them to the top flight, and the visit of Everton gave their new German coach Jan Siewert his first chance to try and help secure their greatly endangered top flight status. With Billing and Williams expected to be ruled out, Siewert was hoping midfielder Aaron Mooy would be ready for a return after seven weeks out and waited as ling as possible before naming his starting eleven: Loessl, Hadergjonaj, Jorgenson, Schindler, Kongolo, Bacuna, Hogg (c), Kachunga, Puncheon, Diakhaby and Mounie. Meanwhile for Everton, amidst rumours of Idrissa Gana Gueye keen on a move to PSG this week and the club having flatly and immediately rejected a bid from the French club of just 21.5m Euros, Yerry Mina was ruled out having joined Phil Jagielka on the injured list. * Note to Marco, many of the fans are not disappointed, they’re absolutely livid about recent form and need to see tangible, visible evidence of your ability to fashion a turnaround. ** Note to fans, tonight’s the night… fingers crossed. For this crucial game against a Town team with just one point gained from their last ten games and with a victory likely to see the Blues leapfrog up to seventh in the table, Silva made five changes in naming his line-up: Pickford, Baines (c), Zouma, Keane, Coleman, Davies, Gomes, Bernard, Sigurdsson, Richarlison and Tosun. Idrissa Gana Gueye was noticeably absent from the substitutes bench. On a cold, wet West Yorkshire evening, the referee was Stuart Attwell. Everton began brightly with a move involving Davies, Richarlison, Sigurdsson and Bernard earning a first minute corner that came to nothing. However the very next move from a throw-in saw the Blues open the scoring. 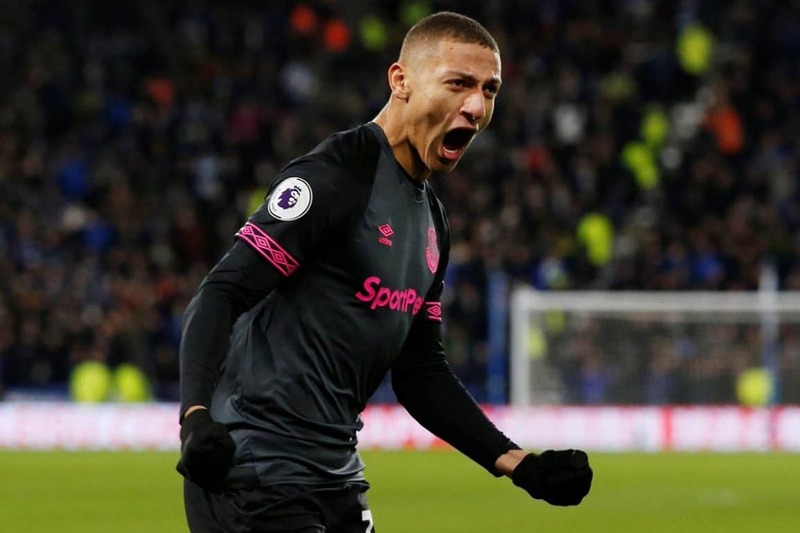 Tom Davies made the run to the bye-line to escape the attention of Hogg, reach the pass from Bernard and cut the cross back for Richarlison whose first effort was blocked, but he reacted quickly to bury the second attempt to give the Blues a dream start. Richarlison to Tosun saw the Turks cross win another corner that Sigurdsson took and which Loessl claimed easily. The Terriers first attack saw Mounie lay the ball off for Hogg who played a one-two before trying to find Mounie, the ball going behind for a goal kick. Tosun went down holding his face after an aerial challenge from Jorgensen, the Huddersfield player somewhat fortunately escaping a yellow card. Sigurdsson saw his free kick evade the wall, but didn’t prove a serious test for Loessl in the home goal. Fifteen minutes played and Everton, grateful for the second minute lead, had settled well and when Richarlison span away from Hadergjonaj, Kongolo did well to deny Tosun on the cross and concede a corner that again, came to nothing. Alarm bells rang at the back though as Town countered and Gomes was hurried into a clearance after Davies let the ball run when he could and should have cleared first time. Good possession saw the Blues swing the ball from right to left and work an opening for Sigurdsson to shoot, Loessl again not unduly troubled by the shot that bounced nicely for him to gather. Kachunga got a lecture from the referee for a foul on Coleman whose honest reaction probably saved the Huddersfield player from seeing yellow. Bernard though became the first to see yellow on the half hour mark as he wrestled the arm of Kongolo to prevent him racing away down the left flank. A Bernard cross from the right saw Sigurdsson try a first-time side foot effort that was blocked and cleared, and when a Keane header was flicked on by Coleman, a lovely inside pass from Tosun gave Coleman the chance to run in and shoot, but the effort was off target, but the nature of the moves was encouraging. Everton were completely dominating the possession allowing the home side little time on the ball with some quick pressing, and Tosun in particular giving Jorgensen and Schindler a stiff physical test. The home crowd were incensed by a silly tackle by Tosun, clipping the heels of Hadergjonaj and the Turk was booked for his troubles. Mounie fired a long range effort well wide in the final minute of the half and at the break, Everton were fully deserving of their one goal lead. No changes by either manager during the break saw the home side come out knowing they had no other option than to go for it. A lazy pass by Richarlison gave the ball away to Kachunga who raced away by was well shepherded by Zouma and Keane allowing Pickford an easy gather. Bernard to Tosun and another sweet ball from the Turk saw Davies break forward to shoot and test Loessl from twenty yards. Baines took a knock to the ribs from Puncheon and after Bernard forced a 54th minute corner on the Blues right, Baines left the action to be replaced by Digne. At the same time, Huddersfield replaced their captain, Hogg, with Aaron Mooy. A free kick dead centre, 25 yards out, following a foul on Sigurdsson saw Richarlison take on the responsibility but his set piece was woefully high and wide of the target. Mooy fed Kongolo wide left and his cross found the head of Mounie, but he couldn’t direct his effort on target. Puncheon was booked for pull back on Richarlison on 65 minutes ahead of Lucas Digne getting a straight red card for a deliberate foul on Diakhaby to present the home side with a free kick just outside the penalty area. Everton lined up the wall and Mooy saw his shot tipped away at full length by Jordan Pickford, his first save of the game. Everton reacted to the loss of Digne by withdrawing Tosun in favour of Jonjoe Kenny to bolster the defence for the remaining 22 minutes, Coleman switching to the left with Kenny on his preferred right side. Huddersfield, unsurprisingly, were now seeing more of the ball looking to make the man advantage count and Everton move to two lines of four with just Richarlison up front to try and cause the home side problems. Into the final quarter hour and the Blues were defending effectively with Huddersfield struggling to make any real impression, until Diakhaby got away from Kenny and crossed for Kachunga to power in a header that Pickford dived full length to his right to turn away, a fine save from the England ‘keeper. Loewe replaced Kachunga with ten minutes to play as Huddersfield sought a late equaliser. Mooy chipped a ball into the Everton box for Puncheon to chase, but the veteran couldn’t get their ahead of Zouma who allowed the ball to run out of play for the goal kick. Coleman was cool in cushioning a header back to Pickford on a cross from Hadergjonaj as the home side continued to try and force something from the game. Calvert-Lewin came on for Richarlison for the final five minutes and Gomes saw yellow for a foul on Mounie before Diakhaby was replaced by Depoitre adding more height to Terriers forward line. Great work by Davies in midfield, taking a pass from Kenny, saw him draw a foul from Mooy to eat up some valuable seconds before four added-on minutes were indicated. Superb support throughout from the travelling fans urged the Blues on as the home fans ebbed away, reconciled to their team having again failed to score and resigned to the almost certainty of relegation to the Championship. DCL picked up a needless booking to eat up some more seconds. Not the most polished of performances from the Blues, but exactly the kind of effort that the fans have been crying out for after too many games where the effort wasn’t in evidence and three valuable points moved the side up to 8th in the table.